The City Hall office road to socialism? Now for a workers' "Lisbon Treaty"
The banks: compensation without nationalisation? 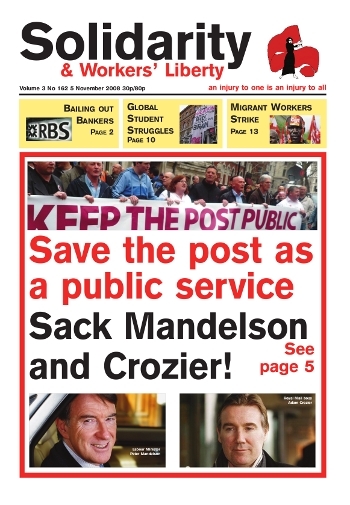 Download pdfs of the paper and of the accompanying posters for Ideas For Freedom winter 2009 and for solidarity with the postal workers (see "attachments"). At the end of October the council offered a “deal” with a shallower pay cut — a cut of hundreds of pounds a year instead of thousands of pounds per worker — and a massive workload increase. In a mass meeting called by the Unison and the GMB unions, workers overwhelmingly rejected this offer. Very many people are revolted at the state of the world. Whether it be in reaction to war, racism, exploitation, oppression or the sickening displays of meanness and hypocrisy that effuse from the bowels of government, we have all experienced that visceral urge to tear the head off this system and those who marshal it. Redmond O’Neill, a leader of the Socialist Action group, has died aged 55 of cancer. Because O’Neill was an official in Ken Livingstone’s London mayoral administration, his death has received wide attention, for instance in the Guardian. Ken Livingstone’s obituary describes him as a “lifelong revolutionary socialist and leading figure on the left for three decades”. In fact, for many years it has been an abuse of language to call O’Neill and his organisation socialist, or even really part of the left. Bob Sutton reports on the Hands Off My Workmate conference. On 17 October around 140 activists and trade unionists met in London for the first “Hands Off my Workmate” conference — a launch pad for a wider trade-union based campaign to defend migrant workers against checks and raids in the workplace. The example of the 19th District in Paris. The new wave of strikes and occupations has sparked a very strong mobilisation around the striking workplaces in the 19th district: TFN, a cleaning company, and Suburbaine, which is building tram-lines. Badiaga, Camara, Doukouré, Dramé, Gakou, Kouyaté, Siby, Sylla are delegates from the Seni strikers, industrial cleaners at Kremlin-Bicêtre (Val-de-Marne). They are members of the CGT. How do you explaing this movement? The struggle was started by those who are currently contracted with Seni, but we have among us comrades who were employed in the past for short contracts. On our picket line, there are some comrades who are not presently employed by Seni. Some have been sacked, some as long as five years ago. Some of us are in the process of being regularised. Since 12 October, a new wave of strikes by around 4,000 undocumented migrant workers (sans-papiers, “without papers”) has swept France. At the time of writing, over 40 workplaces have been occupied by the workers, who are demanding “regularisation” (legal status), employment rights, and changes in immigration law to make life easier for France's hyper-exploited immigrant workforce. Bruce Robinson reviews Race and Intelligence: Science's Last Taboo, 26 October, Channel 4. (Still viewable on Channel 4’s website). Somali-born Rageh Omaar’s programme entered the “dangerous territory” of the purported relationship between race and intelligence. Every few years it reappears in the form of the assertion that IQ tests show black people to be less intelligent than whites and that this is caused by genetic differences. In the early hours of 24 May 1940, twenty men in uniform led burst into the last refuge of Leon Trotsky. The muralist David Siqueiros and his Stalinist cohort riddled Trotsky’s Mexican sanctuary with over 300 shots.